Strategic monthly plan - Based on research of your target audience, I’ll create integrated marketing strategies that meet your goals, speak to your audience and match your brand. Complete content creation/curation - I choose the images, edit them as needed and create the captions. You look them over and approve them or request edits. Post scheduling - Once you approve the post, I schedule the posts to go up at days and times that will best reach your audience. Results measurements - I measure the performance of each post, noting the time of day, day of the week, content and hashtags used so that we can build upon the analytics and continually optimize your content to best reach your audience. Engagement with your audience - Likes, comments, shares, follows, etc. This is the number one most important step to growing your social followings consistently. This is all done by hand. I’m firmly against using bots - Instagram changes their algorithm so often that it is very easy for them to catch you using one (this is against their terms of service!) They’ll shut down your account and you’ll lose everything. It is not worth the risk! Bio/profile optimization - That will best attract your audience in your brand’s voice (emojis, humor, authority, educational, etc.) and get them to follow, like and connect. Strategic hashtag clouds (Instagram) - Each month, we’ll have cloud sets to use for the posts that month that I have thoroughly researched and hand-picked to reach your idea followers. Board + Pin Optimization (Pinterest) - Each of your pins will be organized and optimized with keywords that increase your monthly views, re-pins and drive traffic to your website, blog or store. Network Growth (LinkedIn) - Grow your network with strategically targeted leads that will increase your reach. Personalized introductory messages will be sent to all of your new connections for hands-free lead generation. LinkedIn Recommendation: Article writing is available as an add-on in hourly marketing assistance. ✓ You’re SO BUSY that more often than not your post strategy involves tossing up your latest selfie, pic of the kiddos or a re-post with a handful of random hashtags. ✓ You want to take your social media to the next level with consistent posts that speak to your ideal audience. ✓ You want to acknowledge, engage and grow your following but just don’t have the time. Ready to save yourself from the screen-time stress of social media strategy? 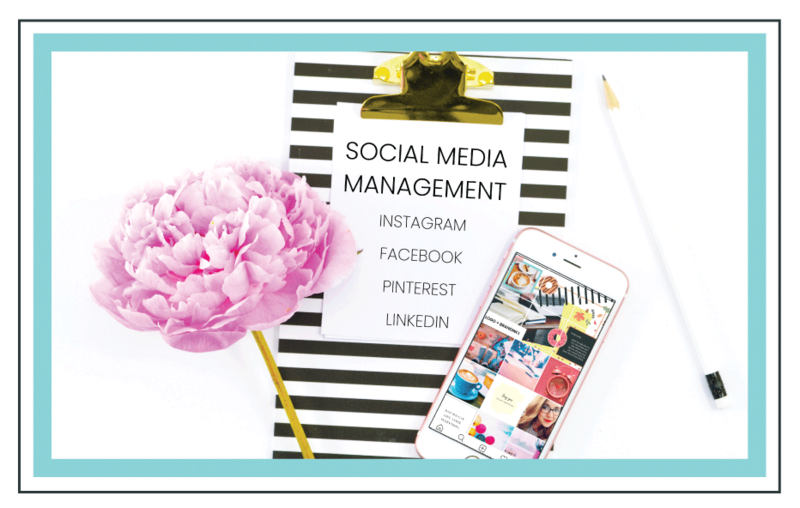 Your fully managed social media package is below!